Matt Lauer, the popular host of NBC News Today show has been fired after receiving a complaint from a colleague about inappropriate sexual behaviour in the workplace. 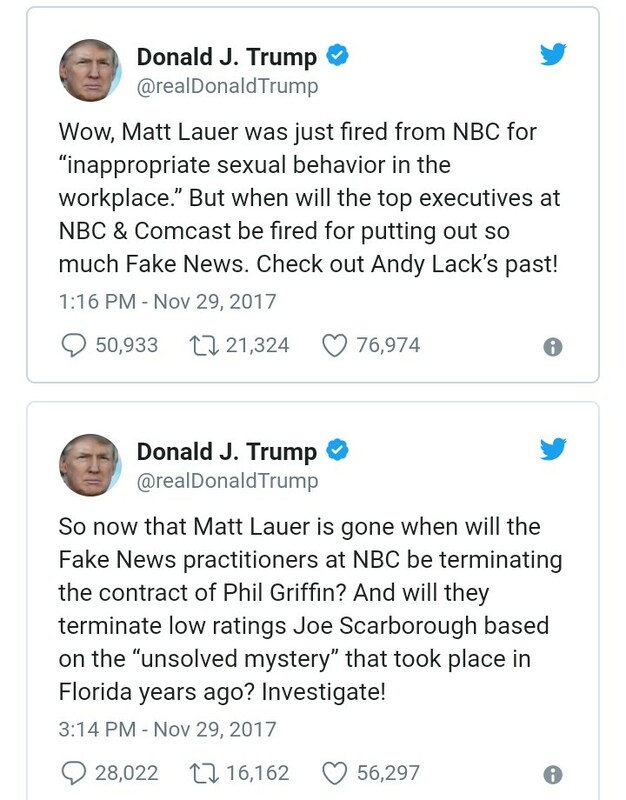 Lauer’s co-host Savannah Guthrie made the announcement during the opening of the show this morning saying “this is a sad morning here at Today and NBC News,” Guthrie said before reading a statement sent to staff by NBC News chairman Andrew Lack. “It represented, after serious review, a clear violation of our company’s standards. As a result, we’ve decided to terminate his employment. While it is the first complaint about his behavior in the over twenty years he’s been at NBC News, we were also presented with reason to believe this may not have been an isolated incident” Lack said in the statement. A very excited U.S. President Donald Trump was quick to respond to the firing, posting tweets almost immediately after the news broke.